As you might have heard, sasCommunity.org -- a wiki-based web site that has served as a user-sourced SAS repository for over a decade -- is winding down. This was a difficult decision taken by the volunteer advisory board that runs the site. However, the decision acknowledges a new reality: SAS professionals have many modern options for sharing and promoting their professional work, and they are using those options. In 2007, the birth year of sasCommunity.org, the technical/professional networking world was very different than it is today. LinkedIn was in its infancy. GitHub didn't exist. SAS Support Communities (communities.sas.com) was an experiment just getting started with a few discussion forums. sasCommunity.org (and its amazing volunteers) blazed a trail for SAS users to connect and share, and we'll always be grateful for that. Even with the many alternatives we now have, the departure of sasCommunity.org will leave a gap in some of our professional sharing practices. In this article, I'll share some ideas that you can use to fill this gap, and to extend the reach of your SAS knowledge beyond just your SAS community colleagues. Specifically, I'll address how you can make the biggest splash and have an enduring impact with that traditional mode of SAS-knowledge sharing: the SAS conference paper. On the dedicated proceedings page for each conference year. For example, here's the collection from SAS Global Forum 2017. By searching the SAS support site, using the proper keywords that relate to my topics. By searching lexjansen.com -- a labor-of-love website by Lex Jansen, who indexes and makes it easy to find virtually all SAS-related conference papers. All of these methods work with no additional effort from me. When your paper is published as part of a SAS conference, that content is automatically archived and findable within these conference assets. But for as far as this goes, there is opportunity to do so much more. 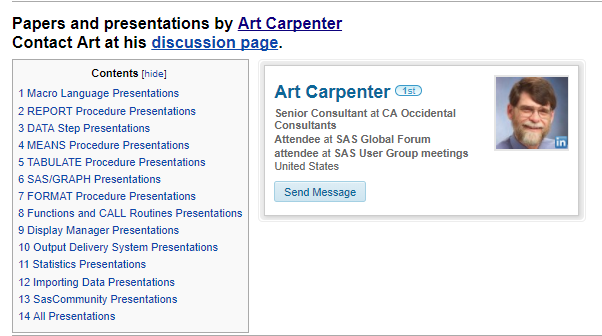 sasCommunity.org supported the idea of "presenter pages" -- a mini-destination for information about your conference paper. As an author, you would create a page that contains the description of your paper, links to supporting code, and any other details that you wanted to lift out of the PDF version of your paper. Creating such a page required a bit of learning time with the wiki syntax, and just a small subset of paper presenters ever took the time to complete this step. (But some prolific contributors, such as Art Carpenter or Don Henderson, shared blurbs about dozens of their papers in this way.) Personally, I created a few pages on sasCommunity.org to support my own papers over the years. 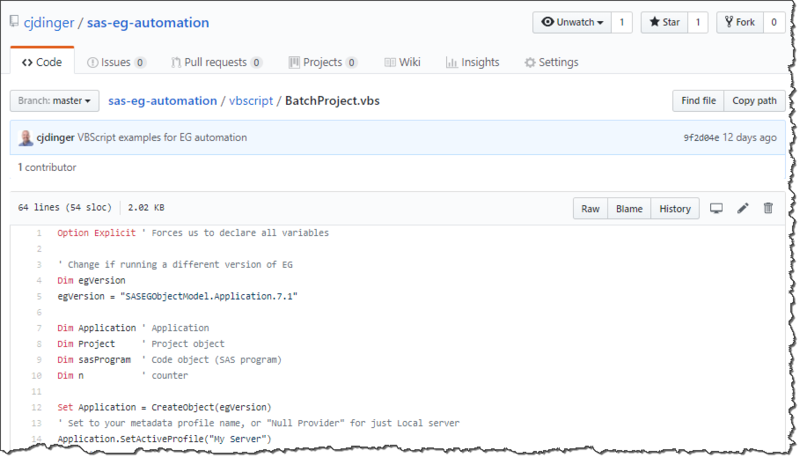 SAS Support Communities offers a similar mechanism: the SAS Communities Library. Any community member can create an article to share his or her insights about a SAS related topic. A conference paper is a great opportunity to add to the SAS Communities Library and bring some more attention to your work. A communities article also serves as platform for readers to ask you questions about your work, as the library supports a commenting feature that allows for discussion. Use relevant key words/phrases in your article title. Cute and clever titles are a fun tradition in SAS conference papers, and you should definitely keep those intact within the body of your article. But reserve the title field for a more practical description of the content you're sharing. Include an image or two. Does your paper include an architecture diagram? A screen shot? A graph or plot? Use the Insert Photos button to add these to your article for visual interest and to give the reader a better idea of what's in your paper. Add a snippet of code. You don't have to attach all of your sample code with hundreds of program lines, but a little bit of code can help the reader with some context. Got lots of code? We'll cover that in the next section. To get started with the process for creating an article...see this article! 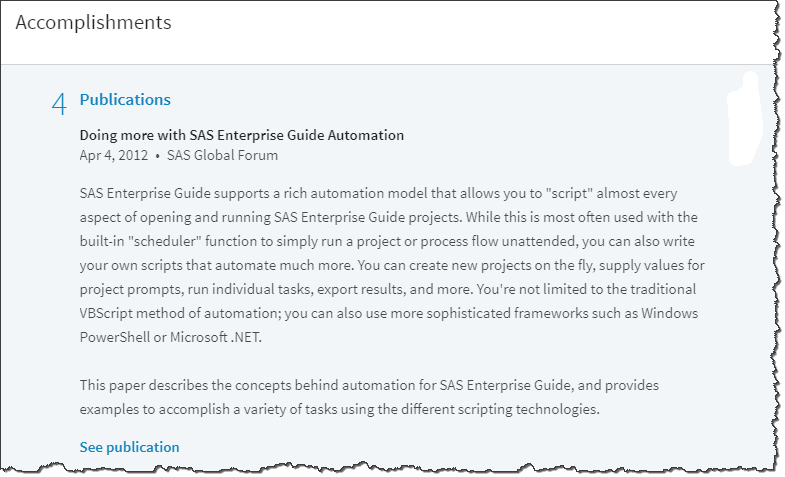 SAS program code is an important feature in SAS conference papers. A code snippet in a PDF-style paper can help to illustrate your points, but you cannot effectively share entire programs or code libraries within this format. Code that is locked up in a PDF document is difficult for a reader to lift and reuse. It's also impossible to revise after the paper is published. A sample of conference-paper-code on my GitHub. So, you've presented your work at a major SAS conference! Your professional network needs to know this about you. You should list this as an accomplishment on your resume, and definitely on your LinkedIn profile. LinkedIn offers a "publication" section -- perfect for listing books and papers that you've written. Or, you can add this to the "projects" section of your profile, especially if you collaborate with someone else that you want to include in this accomplishment. I have yet to add my entire back-catalog of conference papers, but I have added a few recent papers to my LinkedIn profile. Introspection has a special sort of currency on LinkedIn that doesn't always translate well to other places. A LinkedIn article -- a long-form post that you write from a first-person perspective -- gives you a chance to talk about the deeper meaning of your project. This can include the story of inspiration behind your conference paper, personal lessons that you learned along the way, and the impact that the project had in your workplace and on your career. This "color commentary" adds depth to how others see your work and experience, which helps them to learn more about you and what drives you. Susan Slaughter (coauthor of The Little SAS Book) talks about her paper/presentation about SGPLOT. Here's a LinkedIn article that I wrote about a SAS Global Forum video series that I host -- a sort of "behind the scenes" story. And you should connect with/follow our favorite "SAS Nerd" Kirk Lafler. He's a master at sharing his SAS content on LinkedIn. It's not about you. It's about us. The techniques I've shared here might sound like "how to promote yourself." Of course, that's important -- we each need to take responsibility for our own self-promotion and ensure that our professional achievements shine through. But more importantly, these steps play a big role helping your content to be findable -- even "stumble-uponable" (a word I've just invented). You've already invested a tremendous amount of work into researching your topic and crafting a paper and presentation -- take it the extra bit of distance to make sure that the rest of us can't miss it. And perhaps you said this and I just missed it, but anyone's paper can be listed both in their LinkedIn publications list and in the communities library. And SAS Press Authors can do the same for the books they've listed on the books authors page at sasCommunity.org. Absolutely! This isn't a "choose just one path" activity. LinkedIn organizes the content around you, so connections can see what YOU have done. SAS Communities is about the content that people need, and your articles build your credibility by association. The best publishers make a habit of hitting them all. Thanks for the plug! I will miss sasCommunity.org so I really appreciate you outlining the alternatives. Chris, you said, "Since sasCommunity.org has announced its retirement plans, I took this opportunity to create new articles on SAS Support Communities to address some of my previous papers." I believe that sasCommunity.org was started by a small group of SAS users. Have they and/or some successors maintained it since its inception? If so, is that volunteer team retiring from their role? If that is not the explanation for the retirement of sasCommunity.org, what is? sasCommunity.org was founded by the SAS Global Users group, and a volunteer advisory board has maintained and guided it over the past decade. SAS Institute plays a small role in the logistics of the site workings. But the contributors have come from all over the SAS user community. While some of the volunteer board members have retired, the decision to decommission the site has more to do with its declining amount of visitors and contributions (a trend over several years). While the site currently hosts some popular and unique content, the amount of *new* content has diminished -- probably due to the rising use of the other channels that I mentioned in my article. I think everyone recognizes that it's a Good Thing that so many SAS users are making use of available options like SAS Support Communities, GitHub, LinkedIn, and more -- but all of that means that sasCommunity.org has a smaller audience. The decision was made to ensure a responsible transition of the content. We've all seen examples of websites that fall into disrepair and cause confusion by their continued presence in a changing world, and none of us want that for this site. Thanks Chris for sharing these great ideas to help spread SAS tips! AnnMaria, you have your own blog where you can (and do) post your ideas and findings, so you are already one up on most presenters. Of course, we'd love to see your papers get more play in lots of places. You come up with some great topics! Lex Jansen has added the capability to download an XML or JSON index of papers from a custom search! I love having a clickable list of papers at my fingertips. Also, thanks Chris, this is very timely as I was just trying to navigate getting started on GitHub, while mourning sascommunity.org! Ooh, cool -- I might need to play around with that new feature from lexjansen.com! Another great article! Also, thank you for the plug! I look forward to seeing you and thousands of our SAS colleagues at the 2018 SAS Global Forum in Denver.